Test your knowledge with our decades music trivia. Play with family and friends and show off your music knowledge. Trivia from the noughties up until present day. Mix & match with our other decades trivia boxes from the 60’s & 70s and the 80’s & 90’s. Test your knowledge with our decades music trivia. Play with family and friends and show off your music knowledge. Each box contains 50 cards with trivia from the noughties up until present day. 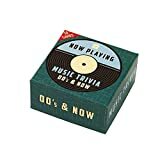 Mix & match with our other decades trivia boxes from the 60’s & 70s and the 80’s & 90’s.